Producing high-quality talks is a fundamental goal for any TEDx event. There are many people who want to speak, but it is hard to find suitable speakers. 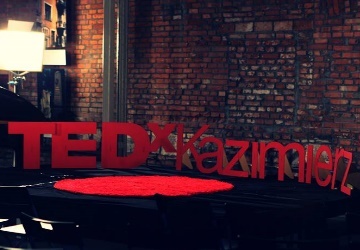 This article aims to describe the TEDxKazimierz approach. There are good, detailed and public speaker-selection guidelines from TED for TEDx organisers, published here. TED Curator Chris Anderson has also written an excellent book entitled TED Talks: The Official TED Guide to Public Speaking, summarized in this video. All of these resources will help you improve the quality of the talks at your events. As an example, here is how we use these guidelines at TEDxKazimierz. Start with the idea, not the person. This is so important. A powerful idea can change the world, and the lives of those who attend our events. We explain this in our public speaker/idea submission form. People often tell me they know the perfect person to give a talk. I always explain that the person themselves may be wonderful, but it is their thoughts and actions that we are interested in. The mission of TED is sharing “ideas worth spreading.” A cool person with slick delivery of a speech that tells you nothing new is not enough. The best ideas are often simple and clear. If it is too complicated to explain in a few sentences, it is often not going to work for our format and audience. As I listen and try to understand, I’ll be asking myself is this idea original, new, different, inspiring, moving, and what impact might this have on my audience? This is actually several questions rolled into one. “Why?” questions are always useful, as they lead to the uncovering of motivations and reasons. I want to know why the idea is important to the candidate speaker, why do they care about their idea? Later in the process, I tell speakers that they need to think about why they care about the idea, and get that across to their audience. If the audience doesn’t feel that the speaker cares, subconsciously they will be thinking, “If the speaker doesn’t care, why should I?” In many cultures, showing emotion is judged unprofessional. 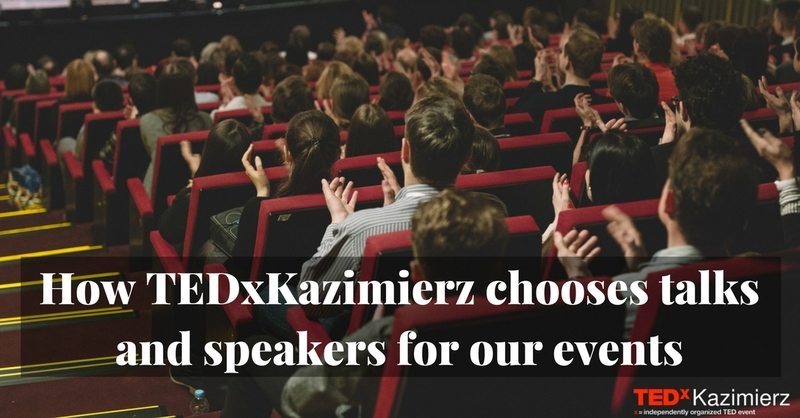 At TEDxKazimierz we encourage speakers to share their authentically held feelings. We don’t want exaggeration and artificial tears. Sometimes the communication of feelings is very low key, but intense. As an example, consider Joanna Garnier’s talk about La Strada International’s battle against human slavery (in Polish). It was obvious she really cared. We are looking for ideas that have impact and will change the way those who attend our event think, feel and behave. If a potential speaker can’t articulate this, it may mean their idea is not that important. What do they want the listener to do with the idea in their talk? Aat TEDxKazimierz, we are “action orientated.” An idea without a call to action can still make a brilliant TEDxKazimierz talk. Even without it, ideas can still have tremendous transformative power. Why is the speaker the right person to talk about the idea? With our “bias towards action,” we like to have speakers who are somehow involved in the project, organisation or activity that their idea is connected to. It’s not essential. We would rather promote a brilliant idea in a talk delivered deputy director, who speaks clearly, with passion and a way of engaging the listener, than a founder who is terrified of public speaking. Being the right person means being fully engaged with the effort it takes to deliver a talk. With “big names,” this can be really hard, as they are often not used to the rigour of the whole speaker preparation process. One of our past speakers, Dawid Ostręga, wrote about his TEDxKazimierz speaker prep experience here. 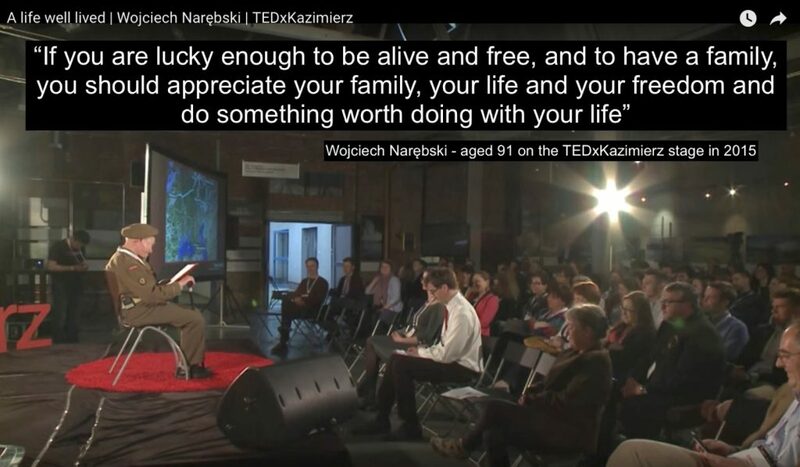 In my experience TEDxKazimierz (and other TEDx teams) aim to both give more and expect more than many events I have attended. Why is now the right time to talk about the idea? This is self-explanatory but needs to be qualified. Sometimes any time is a good time, but right now is even better. Maybe it might have been better to talk about the idea earlier, had we known about it, but better now than not at all. Speakers don’t have to be famous. In some ways, we have a preference for the idea that deserves attention it is not getting. We are very open to unusual speakers or people with little experience. A well-prepared talk about an idea everyone is familiar with (often “life coach” type talks) is almost never what we are looking for. We have a small team that works together on talks, using a Trello-type system called Kanbanery. There has to be someone in our team who thinks the speaker/idea is worth considering. A self-promoting executive looking to put an achievement on their CV is not even going to be considered. After the preliminary research on the idea presented in the speaker submission form or otherwise, we discuss outstanding nominees, and if the idea makes the grade, we do research on the speaker. We check on-line resources to see how much speaking experience the candidate has, whether their experience and track record matches the person they make themselves out to be, and we do deep fact-checking on their idea. Take bad science, for example. For example, TED’s strict rules against putting bad science on the stage. can upset “alternative medicine” and “conspiracy theory” promoters. It’s very unlikely that people putting forward fringe ideas rejected by the discipline from which they come will get the stage. Speaking ability is important, but we think we can work with most people who care enough about their idea to make the effort necessary. One exception is a linguistic barrier: we always allow speakers to use the local language, in order to preserve the authenticity of their delivery. At the event, we provide live interpretation, and post-event, we leverage our collaboration with the volunteer TED Translators community in order to ensure that our speakers’ ideas are shared in both the local Polish and English. We welcome diversity on our stage, whether of age, race, or gender. One of the wonderful features of the whole TED and TEDx movement is that the love of ideas is what brings us together. We take very seriously our responsibility to our participants and attendees. The TEDxKazimierz licence gives us the opportunity to deliver and be part of a world class movement. We don’t want to have substandard talks on stage, and we work long and hard to make sure that every carefully chosen idea and speaker gives the talk of their life. This article is about who we are looking for. In a follow up post, we will discuss other parts of our Speaker Preparation process.